The software has the ability to Automatically GRAB and DECODE Texts in PM-CHATs and CHAT-ROOMs on Paltalk. All you have to do is set a Pass Key and hit on “Start” Button. 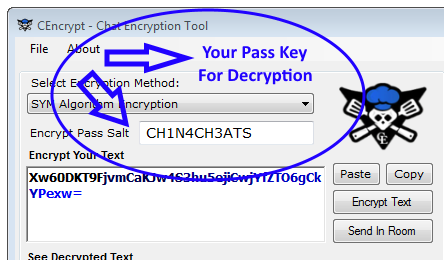 Remember that only users with a “Pass Key” can Decode/Decrypt and read your Text. If there are too many people Texting in the room. And they have to Download and use the same software in order to Decode your Text. The Software is set to use the first Encryption method as default called SYM Algorithm Encryption. Its added by us and our Team on China-Cheats. We believe this is the best and strongest Decryption/Encryption method. IMPORTANT: Make sure ALWAYS to use a secure Pass Key “Password (Salt Hash Key)” shown in the image above. For you to Decode your own text you MUST use the same Password and the same Decryption Method. 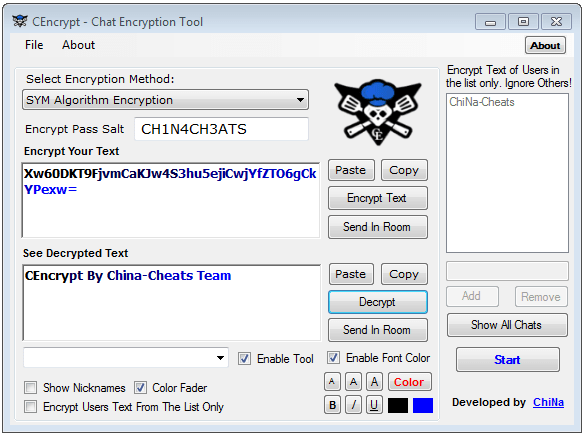 How to use CEncryptText Encryption Tool? – First and for most in order for the other Person/Party to Decrypt/Decode your Text they MUST use the exact same Pass Key and Decryption Method that you have set for your Encrypted Text. Plus they have to Download and Use the same software as you like the one here “CEncrypt – Encryption Tool”. – The software itself can Decrypt and Encrypt any text length without limits. – Without the Pass Key “NO ONE” can Decode or Read your Text. So you dont have to Worry about that. But please be adviced, that there are other Tools out there that uses the exact same Decoding Methods and able to decode your Text if you dont use a Password. Therefor ALWAYS USE A STRONG PASSWORD (PASS KEY). – If there are too many users Texting in the room, but you only need to decrypt one or two persons text, then you can add their Nicknames inside a list so the Software will only Decode users text that appears in the List and ignore the rest. You should use the list because it can slows down the Software if the Texts are not Encrypted. – The software comes with Text Coloring and Fading Effect. But while Decoding any Text we highly recommend you dont use the Color and Fading effect as it slows Down the Decryption and Encryptions effect. Since the software is automatically Decoding Texts from the Chat Wiondow, then please be advised if the Texts are a bit longer than expected, then Stretch your PM Chat Window or Room Chat in order for the software to read the full text. But if the Text is too long, then you will have to COPY AND PASTE it manually. We implemented the Auto Decoding function so users could avoid the COPY AND PASTING manually. But in this case when the Text is too long then we recommend using Copy and Paste mode. Thanks @Locohacker bro. I learned it from you!